Please watch these on large screen and right through! Now, please scroll down this page for statement and photos. On April 17th at 9.41pm I was waiting for my bus to come in after my break, (I'm a bus driver) and was talking to my best man about my upcoming wedding on the phone. I would normally be in our rest room, but since the clock in the restroom was fast (about 7mins fast) I had gone out early to wait while still chatting to my friend. 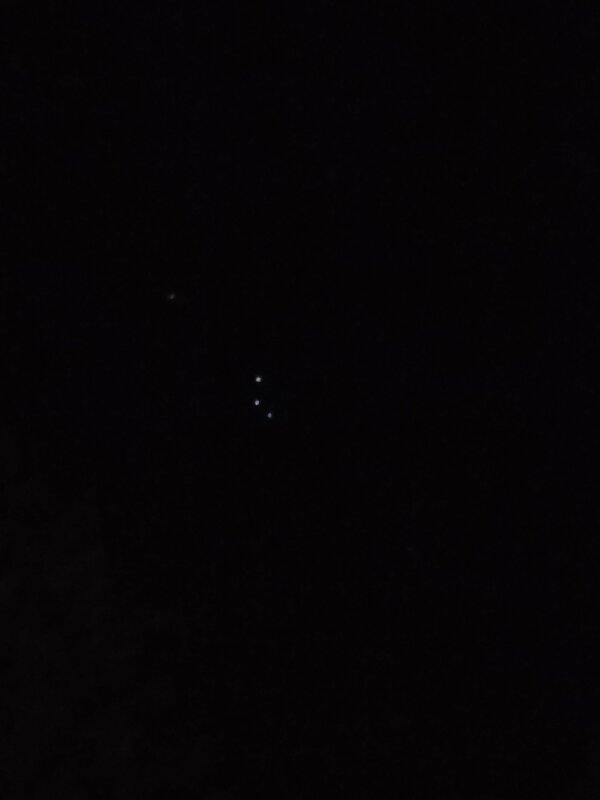 While I was talking, I was just kind of walking about near the leisure center, where my bus stops, when I looked randomly over in the direction of the river, which is when I saw the three lights in a triangle pattern rotating on its axis and wobbling slightly. 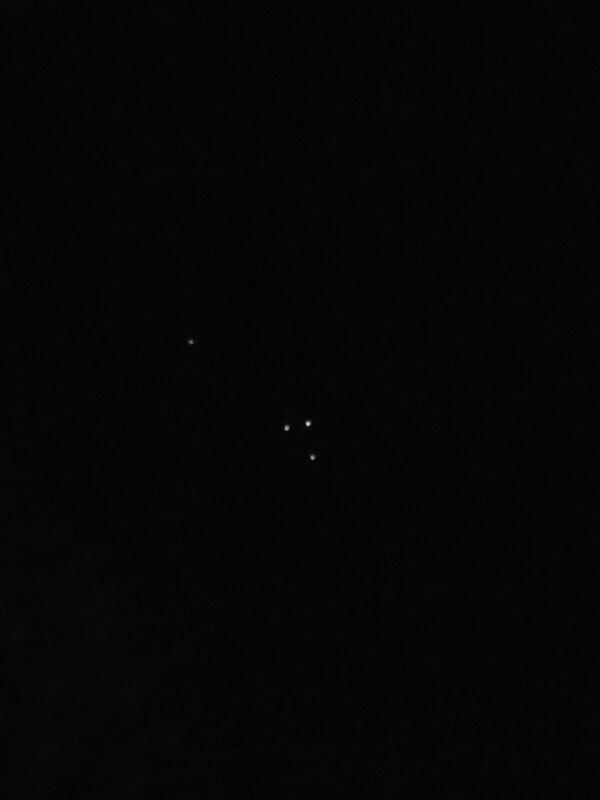 I knew instantly that this is not normal, and as I have been interested in the subject of Ufo's since I was about 10, I told my mate I'd ring him back and started filming the lights with my phone. I then took about 7 photos in quick order and then another 41second vid to send my mate over WhatsApp. For us, the images above categorically prove that these aerial objects are not caused by something like commercial laser projectors shining up into the sky: As shown, the main three objects are later joined by a fourth body, (way off to the left of the main grouping), creating a formation lacking in any sort of symmetry; not exactly the ideal visual to advertise a concert, funfair or a travelling circus etc, we would have thought. 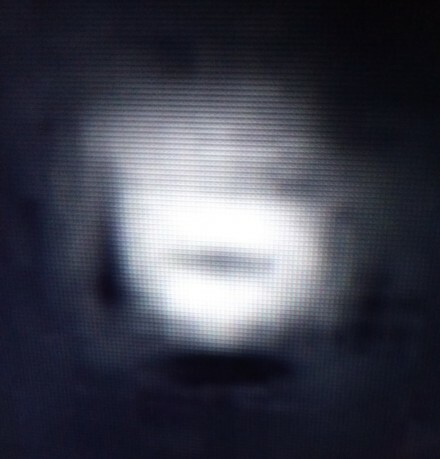 witness said that he did this because he doesn't possess any imaging software other than the basic brightness/contrast controls on his camera phone, and he simply wanted to zoom into the picture further. It's at this point I really had to go back to the bus stop to get my bus, and as I walked over, 4 people got out of a car in the car park and I pointed out the lights to them also (to which they showed a bit of interest - but not much). It was then my bus got there at 10.02pm and I showed the lights to my co-worker who tried to think of any reason they might be something other than a UFO, (drone, laser pointers etc) he went to cash in and finish and I had to drive as I was now 7 mins late lol. I drove to the turn around point and back in est 8 mins, and the lights were gone by the time I got back down to town, (and could not see them on the way down as I had a good view over the area due to the road I was driving). During the event I felt elation and joy, (the only way I can describe it was the feeling MDNA/ecstasy gives you; it's been years since I had any but I'll never forget the feeling of pure joy. It felt exactly like that, a massive endorphin rush) I was bouncing around like an excited child! In total, I talked to about 10 people who saw what I did, with one old gentleman who got on my bus who thought he'd just drunk too much! Our comment: One skeptic has already contacted BEAMS, desperately trying to convince us that these objects are simply drones being flown in formation by some very clever operators; but we do not buy that proposal for a split-second; honestly, some UFO denialists would do anything rather than face the facts! Special thanks goes to MUFON for their assistance and for sharing this case. "2014 - Closest and Clearest Images So Far - The Mystery Flying Triangle, Bedford, UK, August 28, 2014."